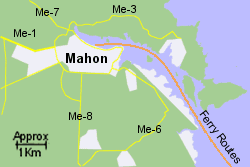 Map of the Mahon Ferry Port area. 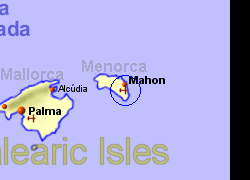 The main port for Menorca, the well sheltered natural deep harbour of Mahon is located adjacent to the city of Mahon, on the south eastern side of the island. 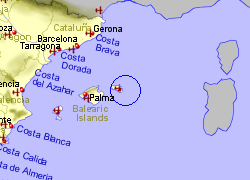 The Me-1 trunk road runs through the centre of the island linking the port with Ciutadella, the islands other significant port, enabling the journey by car in 45 minutes, a distance of 45Km. 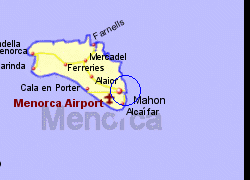 There is also a frequent bus service between the two. Operated by Acciona, 1 crossing per week, crossing time 5 1/2 hrs. Operated by Acciona, up to 5 crossings per week, crossing time 9 hrs. Operated by Acciona, 1 crossing per week, crossing time 14 1/2 hrs.